I’m a big fan of trees. I actually used to serve on the Fairfax County Tree Commission. I mention this because last week we had to have a two-hundred-year-old oak removed from next to our house and it was upsetting for a variety of reasons. At first, it was upsetting because a limb the size of a large tree fell off of the main tree and filled up our front yard and part of the street. The fire and rescue department had to come and cut off the limbs that were blocking traffic. The next day, our friend the arborist, came out to assess the damage and remove the rest of the limb. The assessment wasn’t good. The falling limb left a hole that went more than half way through the base of the tree. Since the diameter of the base was six feet, the hole was quite large. There was no way the tree was going to survive, even though the rest of it looked fine from the outside. There is a lesson in there somewhere about not judging something by it’s outward appearance, but at the time, I wasn’t concerned about that as much as I was upset about losing the tree. It was a grand old tree and it provided a great deal of shade to our house in the summer, which saved us money on our electric bill. It was also beautiful and probably the nicest feature of our yard. I was also upset about how much money it was going to cost to take it down. It was a lot. Much more than the cost of your average tree, although the estimates varied quite a bit based on whether or not the company had it’s own crane. Cranes are pretty expensive to rent and we needed one. One company just wrote “You need a bigger tree company,” on the estimate sheet that they left in our door. That was probably my favorite. 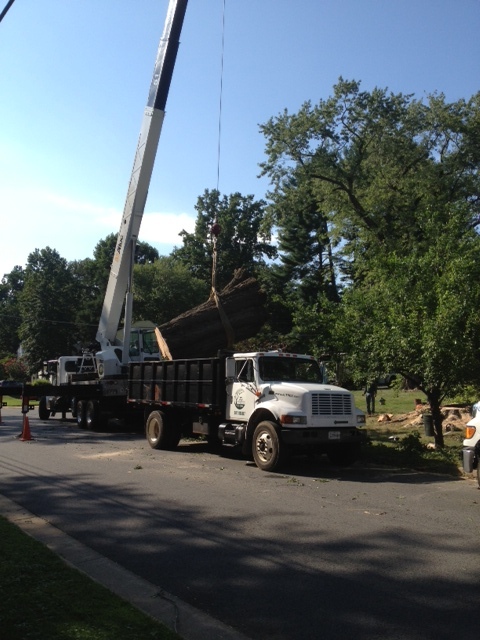 We settled on JL Tree Service out of Fairfax and they did a wonderful job. Hector and his crew came out and worked from 8:30 in the morning until 5:30 in the evening without stopping. The crane was able to move long straight lengths of oak that could be planed into boards on to a dump truck. Smaller limbs were chipped on site. 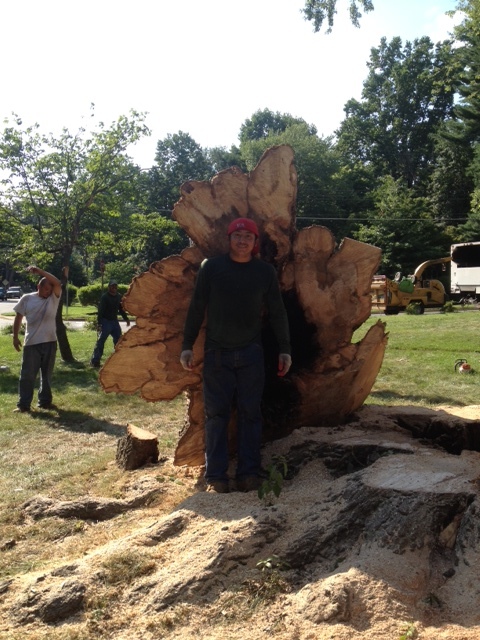 The broad base of the tree took the longest time to cut down because it was wider across than their biggest saw. When they finally were able to pull it over, I got really upset. The base of the tree was rotting, and the rot got wider and wider as it approached the ground until it reached the roots which were in terrible shape. None of this was visible from the outside. I could take the toe of my shoe and push off chunks of sodden oak off. Below that the roots looked desiccated and were black like rotten leaves. Since everything above where the first limb fell off was solid oak, what we had standing next to our house was a ticking time bomb. The tree was incredibly top heavy and had that initial limb not fallen off, we never would have known that. Had it fallen, it would have gone through an intersection, hit two of our neighbors’ houses, taken out power lines for the entire street and pulled out part of the foundation of our house. It could have killed someone or several someones. Standing on the stump, I felt very lucky. It took Kyle and his crew two days to grind the stump and above ground roots and haul away the resulting mulch. They did a nice job and now we just have a large area of the yard that we’ll need to seed in the fall. I suppose the moral of this story is to be mindful of the trees in your yard. They are beautiful, but they can also be deadly. You can see the size of the base in comparison to the cab of the truck. Seven women and three dogs spent a glorious weekend in Lexington, Virginia. Gatherings of my family are always loud, filled with laughter, and a great deal of doting on dogs. This weekend was no different except that the men stayed home. I’m often amazed at how much we can accomplish in such a short amount of time and how much fun we have doing it. This weekend we sorted through a box of fabric that my sister had. It was a collection of leftovers from making clothes when the kids were little. By the time we were done, there were almost 500 quilt squares ready to put together. By “we,” I mostly mean “they.” I don’t have much of an eye for putting patterns together. My job was ironing. At one point, I was upgraded to outlining squares on fabric, which was also within my skill set. In addition to the quilt squares accomplishment, my mother brought us all handmade dish towels, and for me, a new robe that she’d made. For some reason, the one she made me over twenty years ago has gotten a little frayed. They’re a talented group, these women, and it always makes me feel proud and a little awed to be among them. 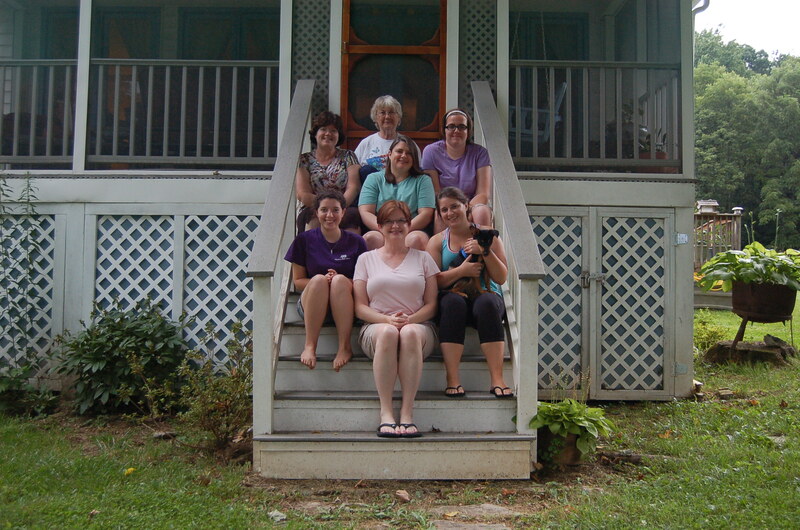 Three generations of women got together this weekend and it was glorious. Maryann Miller at It’s Not All Gravy interviewed me about One Big Beautiful Thing. Maryann asks: What other creative things do you do? My response: I’ve attempted to do many other creative things. I tried to learn to play an instrument only to discover I’m basically tone deaf. I’ve tried my hand at painting. I went to a class recently with my sister-in-law, my sister, and my niece. We were supposed to paint a butterfly on a branch, but that was too complicated for me, so I painted one of my dogs eating a butterfly. Had I been twelve-years-old, that painting would have shown real promise. I did some acting in high school, but my monologues ended up taped all over the stage, because I’m not very good at memorization. I was good at improvisation though, which I eventually realized meant that I’d rather write the script than act it out. Writing is pretty much it for me creatively. As the wife of a firefighter, things like this remind me of why I married him. He does stuff like this. He just doesn’t have a helmet cam to capture it. One Big Beautiful Thing was reviewed on Maryann Miller’s blog, It’s Not All Gravy. You can read the review here. I really like It’s Not All Gravy as a blog title and I appreciate the work she does on that blog. Good stuff. You should check it out. I’m happy to say I was interviewed by Annette Gisby on her blog, Books and Tales. You can read the interview here. I thought Annette asked some really good questions for a thought provoking interview. Here are some more pictures of the converted shed where I work. I’m fortunate to have a place to settle in and get focused. You might notice I only have the one small coworker. Her important jobs are to chew on bones and sleep a lot. She’s excellent at both tasks.